The monsoon season is in full swing. All I want to do is to cuddle up with a book, a comforter and some chai. And some hot, yummy soup when the sun goes down the horizon. Soups are a favourite for most of us, especially during monsoons and winters. But when we think of the time and effort needed to prepare them at home, we end up buying ready-to-make packaged soups. 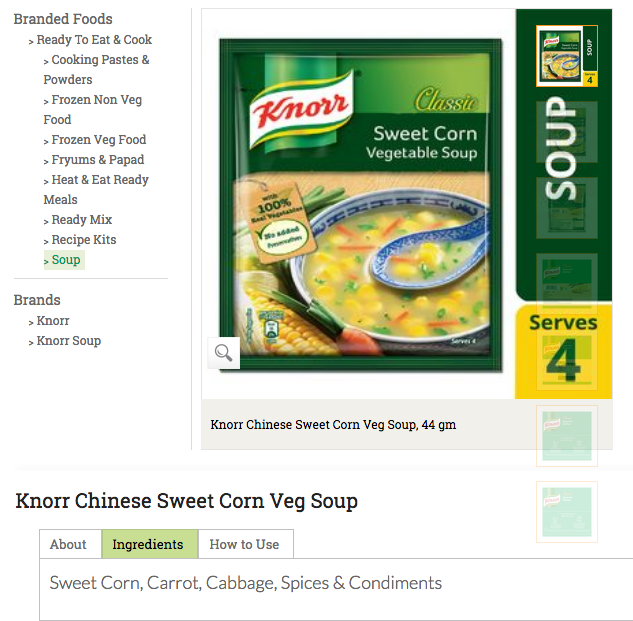 Many years back, I had tried a couple of varieties of Knorr soups. They were quick to make but tasted like sand. Now, don’t ask me how I know the taste of sand :-) I didn’t like the artificial taste that was left behind and I stopped buying them. This was well before the time I started becoming obsessed about reading the ingredients list. I have come across an elderly couple (who have diabetes and high blood pressure) who would drink such readymade soups on a DAILY basis to curb their 6PM hunger pangs. They had always stocked up atleast 10 packs of Knorr soups in their pantry. Recently, while I was roaming the shopping aisles that had these soups, I noticed that Knorr has launched Rs.10 packs as well. And a lot more variations and flavours too. So it seems that the demand for such soups is high. A fancy name for maida. The first listed ingredient, which means the quantity of maida is higher than the rest of the ingredients. A fancy name for corn flour. Similar properties as that of maida, gives thickness to soup. Corn is refined and processed to get a fine powder. It is essentially a highly processed carbohydrate and doesn’t add any nutritional value to any food, other than calories. 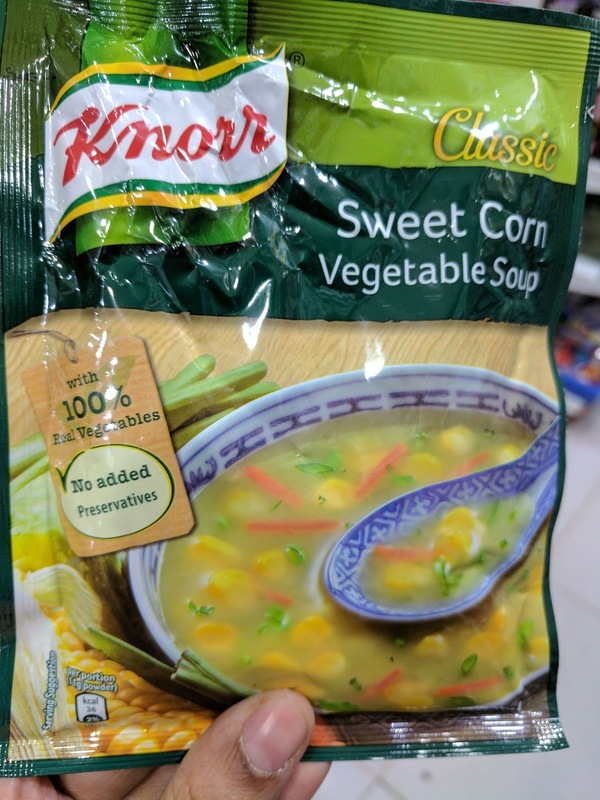 What is the need for sugar in a savoury drink like a soup? As per the nutritional information listed, this has 2.5 gms of sugar in a single serving of soup - a little more than 1/2 tsp of sugar. 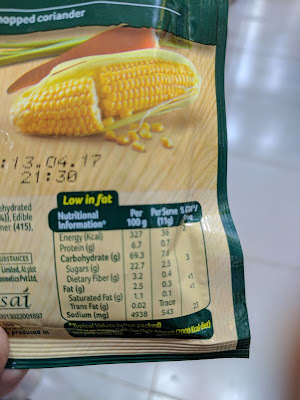 The process of dehydrating or drying vegetables reduce the amount of nutrients, especially vitamins A and C. The vegetables listed in this pack are Corn (7%), Carrot flakes (6%), Cabbage Flakes (2%) and Leeks (0.7%). Such minuscule quantity of vegetables which are anyway dehydrated - there’s hardly any nutrition. The brand might as well call the soup as “maida slurry”. If you have tasted any of these soups, you’d notice the salty taste that is overpowering. As per the nutritional information listed, this has 543 mg of sodium in a single serving of soup. The adequate intake of sodium for adults is around 460-920 mg per day. One serving of such soup will match/exceed your daily sodium requirement. Regular consumption of such high-sodium foods will increase your blood pressure and affect your kidneys. Most of us are aware about MSG and its harmful side effects. Monosodium glutamate (MSG) comes in various forms and one of it is hydrolysed vegetable protein. It is produced by a process, where corn, wheat or soy are boiled in hydrochloric acid and then neutralized with sodium hydroxide. Mainly used as a flavour enhancer because of its “umami” taste. If it is made through soy, then there are higher chances that it may be genetically modified. I had written about this ingredient earlier. This category is used for all hydrogenated oils, partially hydrogenated oils, margarine, Vanaspati etc, which produce trans-fats. The trans-fat content in this pack is 0.02 gm per 100 gm. There’s already maida and corn flour to thicken. What is the need for a separate thickening agent? 415 is Xanthan gum, a polysaccharide, derived from the fermentation of corn sugar with a bacterium. It aggravates food intolerances and allergies. Nothing much to talk about here. Side effects of these ingredients include hyperactivity, asthma, gout, rheumatism etc. 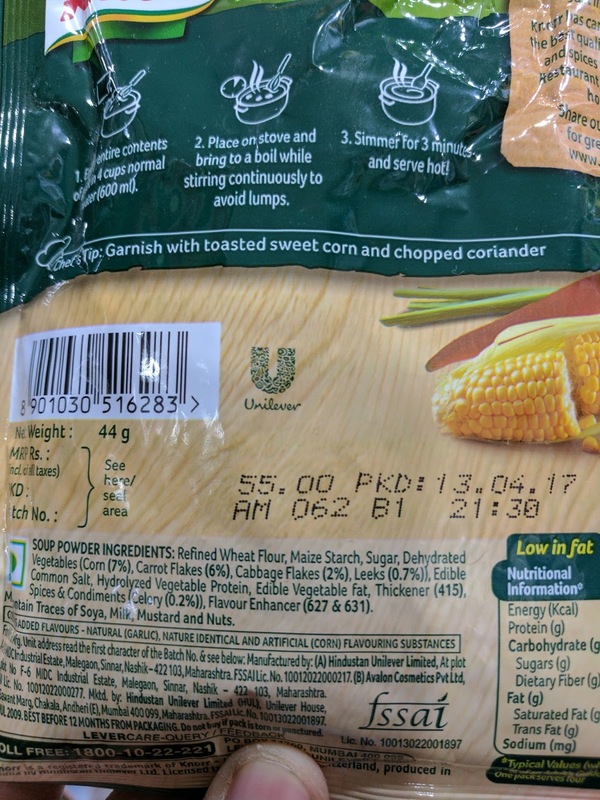 If you are buying such soups, please read the ingredients list carefully. Take a picture, do some googling on what each ingredient means and then decide if you still want to go ahead with your purchase. These days, most of us are shopping for groceries through BigBasket, Amazon or various other online stores. 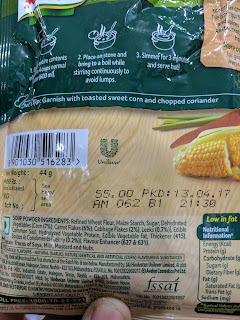 I checked for ingredients list in BigBasket and I was so disappointed that they are not listing the complete ingredients list for packaged foods. I’m not going to stop by just saying “Stop buying packaged ready-to-eat soups”. Let me also share some easy alternatives to make healthy, delicious soups at home that can be made in just 15-20 minutes. 2. Add little oil, coarsely chopped onions, ginger and garlic. 3. Add coarsely chopped veggies of your choice - carrots, beans, corn, cabbage, potato, cauliflower etc. Mix and match as per your taste. 6. Once the steam releases, open the lid. Mash the ingredients using a hand blender. You can mash it when the cooked veggies are still hot. The boiled vegetables give the required thickness. There’s no need for maida/corn flour. 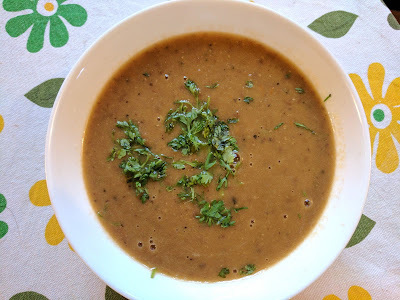 You can even make it a complete meal by adding a handful of moong dal / thuar dal / soaked barley / soaked horsegram. I’m sharing many such soup ideas in my Instagram profile. Do check it out. Thanks for reading this far. Let’s take control of our health. We need to put an end to such packaged non-sense. No, I don’t agree to moderation or once-in-a-while theory. These products are loaded with ingredients that are addictive. I don’t want to give my family even a single serving of such foods.